Women and Men from developing countries to pursue master degree program in a development-related topic at universities in USA . World Bank Group (WBG) provides Joint Japan/World Bank Graduate Scholarship Program (JJ/WBGSP) for women and men from developing countries with relevant professional experience and a history of supporting their countries development efforts who are applying to a master degree program in a development-related topic. JJWBGSP offers scholarships for over 200 Preferred Programs (.xlsx 49 KB) spanning a wide array of development topics and for 14 Partner Programs (.xlsx 15 KB) at universities in U.S., Africa and Japan in key areas of development, including economic policy management, tax policy, and infrastructure management. JJWBGSP scholarships for developing country nationals are not available for any other master degree program. Tuition for your graduate program and the cost of basic medical insurance usually obtained through the university. Note: The JJ/WBGSP scholarship may only supplement, and does not duplicate, any other source of financial support/fellowship you might have. If selected as a finalist or if you are awarded a scholarship, you must inform the JJ/WBGSP if you have other sources of scholarship funds. The JJ/WBGSP stipend may be withdrawn completely or partially if during the scholarship period the Program has evidence of additional sources of support. JJ/WBGSP awards scholarships to applicants who have had at least 3 years of full-time paid employment in the applicant’s home country or in other developing countries acquired after receiving the first Bachelors (or equivalent university) degree within the past 6 years; and are employed in a paid full time position at the time of application. The only exception to this criteria is for developing country nationals from a country on the list of Fragile and Conflict States noted in the Application Guidelines that are posted during the call for applications. In these exceptional cases, we do take into consideration the limited employment opportunities in those countries recently or currently in conflict. For a scholarship to a JJWBGSP Preferred Program master degree, the JJ/WBGSP Secretariat uses the average score of the two assessors to identify the list of semi-finalists. The semi-finalists will be required during the review process to provide supplemental documentation, including a letter of acceptance from a JJWBGSP Preferred Masters Degree Program noted in the submitted application that is either unconditional, or conditional only upon the securing of financing. Unusual circumstances / hardships, when assessing the employment experience and other aspects of an application. The JJWBGSP Secretariat presents the finalists for the preferred program scholarship to the JJ/WBG Steering Committee (composed of members of the World Bank Board of Directors and WB management) for final review and selection for a scholarship. The Secretariat informs the scholarship winners in July. 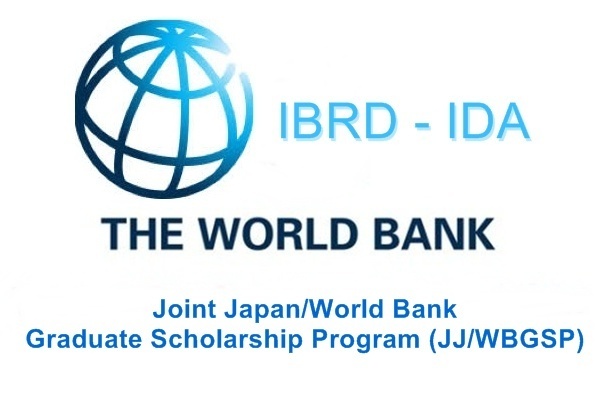 The JJWBGSP Secretariat presents the finalists for partnership scholarship to the World Bank’s Executive Director for Japan for approval on a rolling basis, matching the JJWBGSP Partner university’s admission cycle. The Secretariat informs the scholarship winners to a partner master degree program soon after approval. Those seeking a JJ/WBGSP Partner Program scholarship (.xlsx 15 KB) must first apply for admission to one or more of the Partner Masters Degree Program(s). Inquiries on how to submit an admissions application to a partner program should be submitted to the respective university. Those seeking a JJ/WBGSP Preferred Program scholarship (.xlsx 49 KB) must, in parallel, apply for admissions to one or more of the Preferred Program(s) and apply for a JJWBGSP scholarship through an open call typically announced within the first two months of a calendar year. The next call for applications for a JJWBGSP Scholarship to one of our Preferred Programs is scheduled to open February of current year. View the complete list of JJ/WBGSP Preferred (.xlsx 49 KB) Master Degrees currently offered. For more details candidates are requested to check the official website.